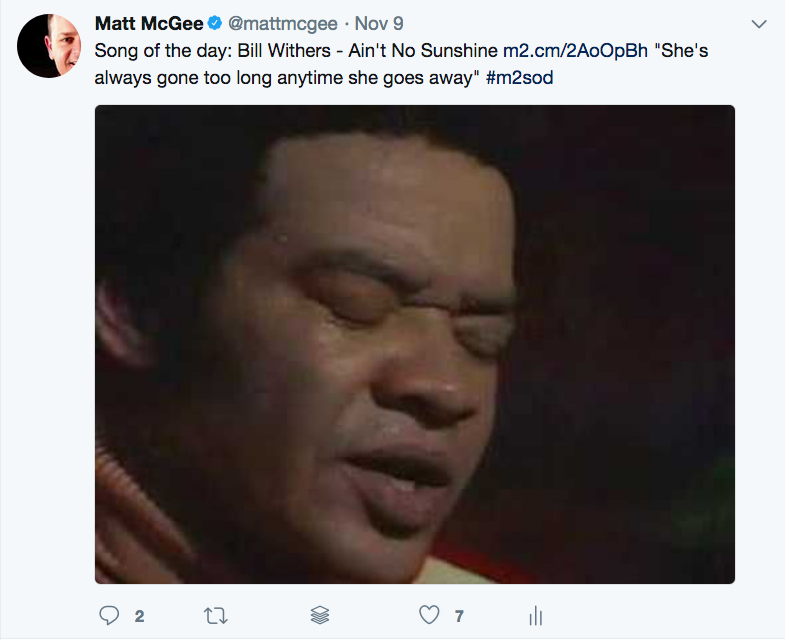 It’s been fun over the past couple months posting a “Song of the Day” (almost) every day on Twitter. I say “almost” because I know I missed a couple days here or there, always unintentionally. But I’m on a pretty good streak right now — knock on wood — and it’s become something I think about during the day while I’m driving, working, or doing whatever else that lets me listen to music. And as I scroll through the day’s songs, many times a lyric from a certain will come to mind — a lyric that somehow reflects what was going on in my world that day, or the world that day, so I include that lyric, too. This is much easier to do now that Twitter has expanded to 280 characters! There’s almost always a meaning behind the song I choose. I picked “I Won’t Back Down” on the day of Tom Petty’s death. I feel like I’ve picked a lot of songs about death, both before and after my mom died last month. Other songs have had meanings that only matter to me, and that’s okay. All of this began sometime around mid-September; I don’t recall the exact date. But I do remember that the first song of the day was REM’s “Man On The Moon.” My choices have ranged from the unsurprising (REM, U2, Adele, etc.) to the largely unknown (Gavin Friday, Lynn Miles, Reamonn, Kieran Goss). One thing I’ve enjoyed is the conversations that some of my choices have started. It’s cool to see how my friends and followers pick up on certain songs or artists or whatever. I’m glad I started doing this … and now that I think about, I better go get today’s song posted! BTW, you can use Twitter search to see at least some of the choices I’ve made by checking the #m2sod hashtag.